The short growing season and cold climate of Saskatchewan make gardening a challenge. Many fruit trees and bushes require long, hot, sunny days, and the fruit simply won't mature in Saskatchewan. Blackberries generally prefer warmer climates, but when in a suitable site and with the proper care, gardeners in Saskatchewan can grow enough blackberries to eat fresh, plus have some left over to make into blackberry jam. Choose hardy blackberries that mature early in the season. Most of Saskatchewan is in USDA Plant Hardiness Zone 3, so you'll need plants that can survive long, harsh winters and will mature before the first frost hits. Cheyenne, Black Satin and Prime Jan are good cultivars to consider. Some wild-type blackberries (sometimes called dewberries) may also perform better in a cooler climate. Ask your local garden center which blackberry cultivars are best for your garden. Find a suitable site. Blackberries thrive in full sun, and a south-facing slope will help keep them warm. Planting blackberries up along your house may also help them make it through the winter. Avoid low-lying locations where early or late frosts might settle or where standing water might collect. Blackberries like fertile, well-drained soil with a 5.5 to 7 pH. Prepare the site by removing any sod or weeds. Amend the soil with compost to improve fertility. Plant blackberries in the spring as soon as the ground is workable. Bareroot blackberry plants are dormant, and should not be injured by a few light frosts late in the spring. 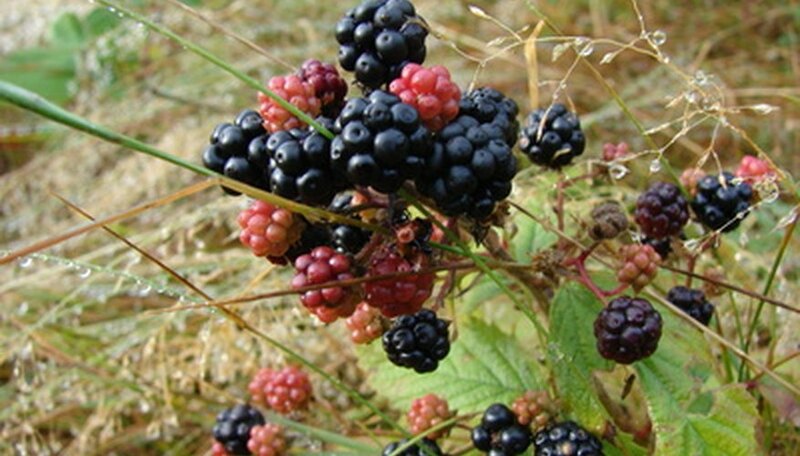 Gardeners in Saskatchewan can expect to plant blackberries in late April or early May. Dig a hole as deep as the root ball and twice as wide. Build a small mound in the middle to spread the roots over, and backfill with soil. Blackberry bushes should be spaced 4 to 10 feet apart, depending on the variety, in rows about 8 to 10 feet apart. Water your blackberries thoroughly after planting, and continue to provide about 1 inch of water every week during the growing season. Train blackberry brambles to grow up a trellis. Blackberries tend to sprawl, and a trellis keeps them contained. Use a simple wire fence, garden stakes, tomato cages or anything else you might have on hand to keep the blackberry vines off the ground. Cover the soil with several inches of mulch, such as leaves or shredded bark, to keep down weeds and help regulate soil temperature and moisture. Apply additional mulch in the fall to help the blackberries make it through Saskatchewan's cold winter. Spread compost over the soil in the blackberry patch in the spring. Avoid fertilizing your blackberries in the fall, since that may encourage the plants to put out tender new growth that will be damaged by the chilly temperatures and heavy snows of winter.